Sub-bottom Profiler Survey, Interpretation, and Theory. Geophysical Services LLC has provided geophysical surveying and mapping services for over thirty years. As a geophysical consulting firm, Geophysical Services LLC offers services to address issues relating to geology, mining, environmental studies, hydrogeology, locating underground storage tanks, concrete scanning, archaeology, engineering, contamination, forensic science, agriculture, real estate assessments, corrosion, electrical power and transmission line facilities, ground vibration monitoring, and underground private cable, pipe, and facility locating. 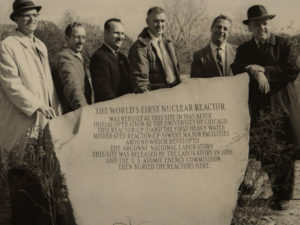 Located the world’s first nuclear reactor after being buried at Argonne National Laboratory’s Site A. In addition, geophysically delineated underground rooms and tunnels. Provided detailed high-resolution geophysical services (Geonics EM31 terrain conductivity survey, magnetometer survey, and GPR surveys) over approximately 37 acres, which delineated 3.3 linear miles of buried drum trenches containing an excess of 100,000 drums. Vertically imaged kimberlite pipes in the Arctic Circle with BHP to assist with evaluating diamond mine reserves. Also, initiated GPR surveys to map ice thickness over lakes for drilling programs. Geophysically investigated West Point’s Battery Bryne and Execution Hollow. Results yielded anomalies consistent with the anticipated spacing and location of two 12-inch Model 1890 MI Mortars on Model 1896 MI Carriages. In addition, the geophysical results provided an approximation of the lateral extent and depth of West Point’s Execution Hollow. Conducted geophysical surveys to assist the Department of Criminal Investigation to locate clandestine burials in areas of concern identified using cadaver dogs. Geophysical services provided to other government agencies on an as needed basis. Acquired MASW data from depths greater than 200 feet using an unequally spaced geophone array and an elastic wave generator capable of about 7,000 foot-lbs energy and 2 Hz geophones. Also, conducted an extensive comparison study of eight land streamer designs, based on weight, cross sectional area, and plate pressure. Geophysical surveying and mapping services utilize near surface geophysical instruments and methods. For instance, ground penetrating radar, MASW, electrical resistivity tomography, frequency domain EM, time domain EM, seismic refraction, seismic reflection, parallel seismic surveys (maps depths of sheet pile and pile tips), sub-bottom profiling, magnetic, borehole, and gravity. As a result, these services often implement equipment using AGI’s SuperSting R8 electrical resistivity imaging system, Geometrics’ capacitance coupled OhmMapper, Mount Sopris’ borehole tools, Geonics EM31 EM38 EM34 EM61 systems, Geometrics Geode, GeoStuff’s borehole geophones, Ballard’s Shear Wave source, and GPR systems manufactured by Sensor & Software (Noggin, pulseEKKO, and Conquest). Who is Geophysical Services LLC? Art Fromm, owner of Geophysical Services LLC (formally Fromm Applied Technology) and a professional geophysicist, started as an independent geophysical consultant in 1985. He became a geophysicist after talking with an experienced physicist, geophysicist, professor, and, today, lifelong friend. After earning a degree in math and physics, his professor inspired him to sign up to become an applied geophysicist. Fromm, with his math – physics and geology – geophysics degrees from the University of Wisconsin, decided to apply his knowledge to assist people with investigating the subsurface using near surface geophysical surveying methods. He personally oversees and frequently acquires the geophysical data. He is skilled at processing, modeling, and interpreting the geophysical results. Having spent a vast amount of time in the field with sophisticated electronics, he is also capable of maintaining, repairing, and troubleshooting geophysical equipment, which minimizes down time and keeps projects on schedule and budgets in the black. Today, he also owns a geophysical rental company, K. D. Jones Instrument Corp.
Argonne Lab at Palos-Worlds First Nuclear Reactor (courtesy of FPDCC government archives). It is Geophysical Services’ opinion that quality and professional geophysical surveys have more to do with the personal approach of the geophysicist than it does with how the newest geophysical technology is packaged. Today we have available to us some of the greatest geophysical instrumentation ever engineered. A geophysicist needs to choose his geophysical instruments wisely. That is why Geophysical Services LLC supports a wide range of geophysical methods. Seldom can one method characterize a problem or produce an obvious interpretation. This website offers many layers of information about geophysical surveying and equipment. One will find entire pages on the sections summarized below. For more information, either follow the link at the bottom of each section to a site menu or use the main menu for this page. Without doubt, one cannot drill enough holes or dig deep enough to characterize what is below the surface at a study area to achieve 100% confidence. In fact, too many drill holes and deep excavations could change the behavior of the site. Thus, geophysical surveying and mapping services are needed for studies involving geology, environmental remediation, hydrogeology, mining, oil and gas exploration, engineering geophysics, real estate assessments, concrete scanning, archaeology, ground vibration monitoring, magnetic susceptibility, shear wave analysis, forensic science, line locating, and agriculture. Follow this link or go to the menu and click on the tab for geophysical services. In the same way that geophysical services have a tendency to lend themselves to specific professions, groups of geophysical equipment correspond well with various types of services. A geophysicist simple scales the services to the application. The physics behind the methods hold true independent of the size of the target. To illustrate, the characteristic magnetic response from a spherical iron ore body at great depth is nearly the same as the response from a steel cannon ball at an archaeologic dig. By all means, the spatial size and magnitude are different for these two applications. However, the cause and effect is the same. The same mathematical equations define the response in both cases. Therefore, the same geophysical surveying methods and equipment often work well for a wide range of investigations, independent of scale. The unexpected backlash from great geophysical surveying and mapping services is that people believe geophysicists have a proverbial crystal ball. On the contrary, the geophysical equipment simply responds to the conditions at depth. The instruments may work well at one site and produce unimaginable results at another site. When one effectively matches the equipment with the site conditions and target, the geophysical survey yields desirable results. Poor or unexpected site conditions at depth can produce a complex response that will not yield a reasonable interpretation. Without borings or other direct observations, it is difficult to know when this happens. In fact, interpretations of the results, no matter how reasonable they may seem, may not reflect the true conditions at depth. Continue reading by clicking here or on the tab for geophysical equipment. Today, geophysical surveying and mapping services are very fortunate to have advance electrical instruments like ABEM’s Terraloc LS, AGI’s SuperSting, and Geometrics’ OhmMapper. Though this section has only one web page, it is a robust enough subject that one can find books about the topic. It was not too long ago when a complex electrical resistivity survey consisted of localized soundings or multiple profile lines. During this time, the soundings and profiles used four electrodes with transmitters that seldom exceeded 50 watts. In contrast, one can now find electrical resistivity imaging systems that have 84 electrodes and over 200 watts of power. Though electrical resistivity tomography surveys often have a hefty daily cost, the cost per data point is extraordinarily low. In addition, surveys are physically less demanding and cover much larger areas in less time. In brief, the discussion in this section answers questions on: a) How does electrical resistivity tomography work? b) What is the electrical resistivity tomography method and how does traditional galvanically-coupled or DC resistivity methods compare with capacitance coupled resistivity methods?, c) What electrical resistivity tomography equipment is available? (provides a summary on Geometrics OhmMapper specifications (details from Geometrics) and a summary of AGI’s SuperSting R8 electrical resistivity system specifications), and finally d) What PDF’s are there about electrical resistivity tomography? Click here or find the electrical resistivity tab in the menu for more information. In my opinion, Multi-channel analysis of surface waves or MASW is the most recent and significant contribution to the near surface geophysical community in many years. To clarify, there are other innovative geophysical surveying methods available and new ones on the horizon. However, not many of them are commercially viable. While the development of electrical resistivity imaging methods was an incredible breakthrough, electrical resistivity soundings emerged about 50 years ago. In contrast, I believe the start of what is now MASW became popular in the 1990’s. Without doubt, these two methods are very important in today’s near surface geophysical market. Currently, Geophysical Services LLC has MASW equipment tailored to explore very shallow depths less than 25 feet, shallow depths between 25 and 50 feet, medium depths between 50 and 100 feet, and specialized equipment for depths between 100 and 200 feet. The section on MASW discusses what is MASW and why to use it. The most obvious reason for using MASW is to characterize the local geology. 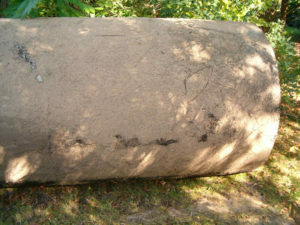 However, it has proven to produce reasonable results when looking for buried structures and voids. 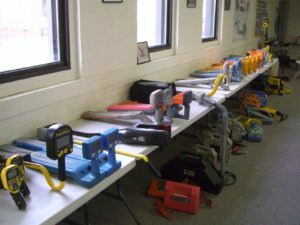 While the very low frequency geophones needed for greater penetrations are a specialty item, most of the equipment is off the shelf and easy to obtain. The backbone to the method is the recently developed software. The method flourishes because of the development of powerful PC’s. The seismic method yields results that correlate soil stiffness with shear wave velocities. For this purpose, the shear wave velocities come from analyzing the propagation of surface waves and how the energy disperses along an array of geophones. Click here or follow the main menu to visit the page about MASW. The parallel seismic survey method is a nondestructive test (NDT) that assists with estimating the depth of a sheet pile, foundation, or pile below a foundation. The survey interprets the first arrival times of a seismic pulse as a function of depth from within an adjacent borehole. While there are limitations (e.g., borehole conditions, placement of the borehole, and ambient noise), it generally yields an acceptable approximation of the depth pile tip. Under good conditions there are up to four approaches for interpreting the parallel seismic survey test results. 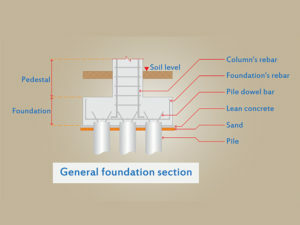 Two of the approaches are indications if the minimum or maximum depth of the pile is in an acceptable zone. The last two methods for interpreting the parallel seismic results yield an estimated depth or apparent depth for slanted installations. Parallel seismic tests for foundations, piles, and sheet piles. Click here or follow the main menu to visit the page about Parallel Seismic Survey Methods, Tests, and Instruments. Ground penetrating radar or GPR is likely the most popular geophysical instrument on the market. Those who locate underground cables and pipes drive its popularity. 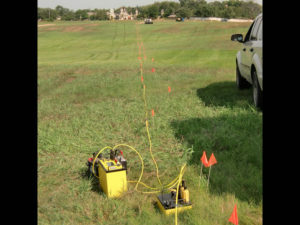 As long as there is not a significant amount of clay, water, or other electrically conductive materials, GPR provides a great method for locating private cables, pipes and facilities (sometimes mistakenly called a utility). Used with a commercial line locator (e.g., Dynatel, Pipe Horn, SubSurface Instruments, RadioDetection) one can be fairly confident of locating most underground cables and pipes. By adding a Geometrics magnetometer with one of Geonics’ EM31’s or EM61’s, one has tapped into most of the technology available today for locating underground cables and pipes. 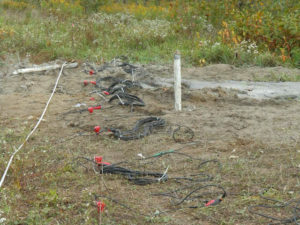 In addition, this section demonstrates that GPR has far greater importance than locating cables and pipes. This is never more true, after the introduction of Sensors & Software’s pulseEKKO Ultra Receiver. It is often capable of reaching depths twice as deep as its predecessors. 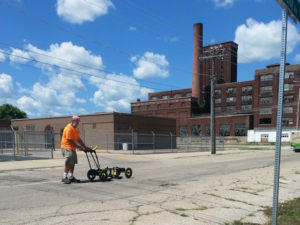 GPR is a valuable tool for imaging concrete along with characterizing geology, identifying environmental issues, assisting archaeologists, and locating buried metal like drums, underground storage tanks, and weapons. The geophysical instrument has many purposes. In fact, farmers use GPR, golf courses benefit from GPR, and ski resorts use GPR to measure snow and ice thickness. Follow this link or use the menu to find out more about GPR. Geophysical surveying and mapping services are available to locate, find, or detect underground storage tanks, also called UST’s. 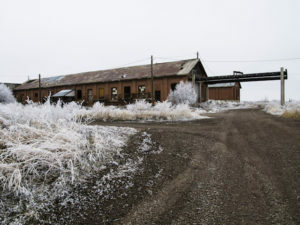 I remember a time when state and federal regulations emerged that effectively declared many underground storage tanks as environmental hazards. 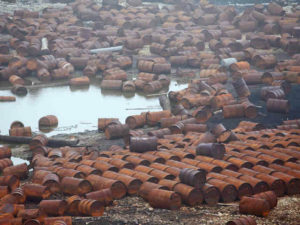 Of course, it was and still is obvious that those with the most money are often responsible for the removal and cleanup of leaking underground storage tanks. Soon after, I went to the banks and gave presentations on the problem. I pointed out that, if they foreclose, they could take on an unexpected liability. Nonetheless, I was kindly thanked for the presentation and then told that the bank would never accept such liability. Guess what? It happened. These days banks, financial institutions, and investors frequently demand geophysical services to locate UST’s. Click here or go to the menu and click on the tab finding UST’s. 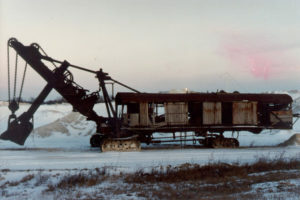 Some of the earliest geophysical surveys done at Geophysical Services LLC were with sub-bottom profilers. The results are remarkably similar to GPR. The reason for this is that both methods input a pulse into the subsurface and wait for a response. 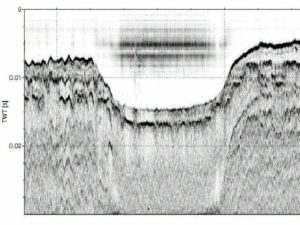 In contrast to GPR, which depends on the propagation of an electromagnetic pulse or radio wave to pass through the subsurface, a sub-bottom profiler generates acoustic energy underwater. In both cases, the energy reflects off surfaces at depth, which eventually produces a reflection record. Sub-bottom profiler hydrographic surveys assist with characterizing infilling of sediments and depth to bedrock. Depending on the size, shape and depth, sub-bottom profile surveys discover man-made structures, cables, pipes, and erosion. While large corporations conduct sub-bottom profile surveys in the ocean in very deep water to find oil, gas, and mineral reserves, near surface geophysical applications are conducted in lakes, harbors, rivers, and large reservoirs. Follow this link or go to the menu and click on sub-bottom profiling for more information. Without doubt, engineering geophysics crosses many disciplines. 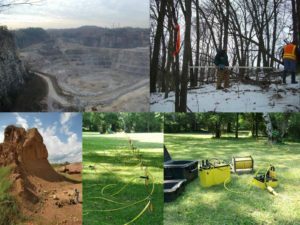 This web page is dedicated to this area of geophysical study focuses on electrical resistivity surveys for electric power, seismic surveys for measuring seismic velocities, ground vibration monitoring, and borehole logging methods. Engineering geophysics has its own page because the requirements are often well defined and more focused. These types of geophysical surveys are quantitative and analytical in nature. A geophysicist will often need to follow an ASTM or IEEE guideline. These engineering guidelines, though specific, are not always necessary for geologic investigations. Without doubt, a large portion of this web site applies to engineering geophysics. To read more, click here or the “Engineering Geophysics” tab on the main menu. Subsequently, this section of the website offers posts about unique subjects. Topics in the FAQ, articles, and posts section that relate to geophysical surveying and mapping services include a discussion on NAICS and SIC Codes for Geophysical Surveying and Mapping Services, a chart comparing 57 geophysical methods with 17 applications and disciplines, a discussion on less common near surface geophysical equipment, and a short list of clients, locations, and government agencies that utilized Geophysical Services LLC’s services. Surely, the chart of 57 geophysical methods is one of the most robust lists I have encountered. Though it is one of a kind, one should not think of is as a definitive guide. In fact, there are always exceptions. In short, the geophysical comparison chart assists with matching areas of interest with near surface geophysical applications. Follow this link to view the home page for FAQ, Articles, and Posts. FAQ's, posts, and articles are great resources for understand many of the smaller details associated with geophysical services. we're trying to accomplish something." The greatest danger in the geophysical profession is not having a well-educated field hardened geophysicist overlook or misidentify a geophysical anomaly. It is knowing that an untrained person can turn on a geophysical instrument without having any past experience on how to operate the geophysical equipment and acquire geophysical data. To put this another way, ask before you contract if an experienced geophysicist will be going to the field? In short, Arthur Fromm is a Licensed Professional Geologist/Geophysicist-Started 1985-Conducted over 1000 geophysical surveys since 1985. Near surface geophysical surveying and mapping services is a profession. Finally, the information provided in this site, by Geophysical Services LLC (formally Fromm Applied Technology) and/or GeophysicalServices.com, is not a replacement for studying books and user manuals, common sense, experience, or for the education necessary to conduct successful geophysical surveys. In addition, a background in physics, geology, geophysics, engineering, and/or mathematics benefits survey designers and operators. If one is looking for geophysical reference material, one can find a wide selection of books and reading material by searching the internet. 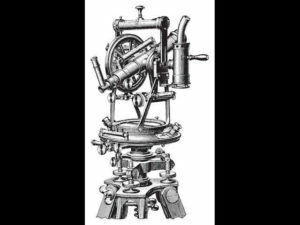 A good place to start is to visit the manufacturers’ websites. Because there is always the potential for misinformation here and throughout the internet, it is highly recommended that one goes through all procedures at the office or home base before going to a project. Without doubt, it is very important to experiment with geophysical equipment over known conditions and to understand how the equipment operates and responds. Geonics Instruments, GeoStuff, Ballard, Geometrics, AGI, Sensors & Software, and other manufacturers found at this site are their Trademarks and are independent of GeophysicalServices.com. As noted in other places at this site, visitors are not allowed access, unless they agree to the terms and/or conditions. Geophysical Services Conducted. 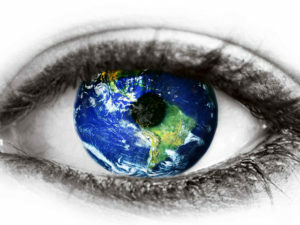 A Short List of Clients, Landfills, Government Sites, and Locations.